, hurricanes, and even Santa's annual flight around the world on Christmas Eve. Recently, the Google Earth Outreach team has been following another type of long distance journey: Jklynn, the female Hawksbill sea turtle, on her annual migration. Jklynn’s travels are available to all -- thanks to the efforts of WIDECAST, the Wider Caribbean Sea Turtle Conservation Network, a recipient of a Google Earth Outreach Developer Grant. 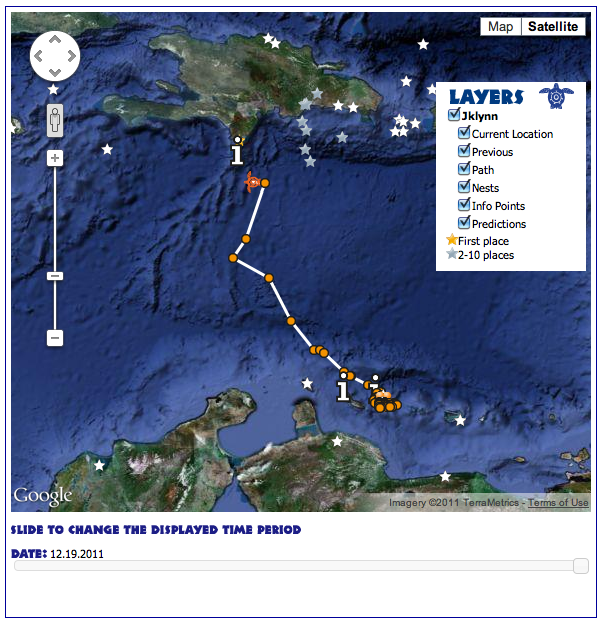 Using the Google Maps API, they’ve developed the “Great Migration Game” to follow the movements of Jklynn and make the task of tracking her journey interactive for students in Bonaire. Middle and high school students can predict where the sea turtle will end up after the nesting season for the chance to win prizes. The migration began in October 2011, when Jklynn was outfitted with a satellite transmitter by Sea Turtle Conservation Bonaire. The study aims to improve our understanding of the migration routes and nesting areas of Hawksbill turtles. Jklynn has nested and laid eggs multiple times off of Klein Bonaire, with 86 students eagerly watching her progress. Now, she’s now well on her way again and keeping the students guessing every step of the way! Jklynn’s satellite transmitter sends regular updates of her position to the map, developed by Ojingo Labs. Sea Turtle Conservation Bonaire was also on hand to film Jklynn’s first hatchlings emerge from their nest on Klein Bonaire. As her trek continues, you can also follow Jklynn on Twitter or on Sea Turtle Conservation Bonaire’s Facebook page. Enjoy the rest of the journey! Over the years we’ve shared a variety of Google Earth tracking opportunities, including oceanic expeditions, hurricanes, and even Santa's annual flight around the world on Christmas Eve. Recently, the Google Earth Outreach team has been following another type of long distance journey: Jklynn, the female Hawksbill sea turtle, on her annual migration.